I have been trying to find the time to write a about my family vacation we had earlier this month, it will not be today either! I will get to it soon though. 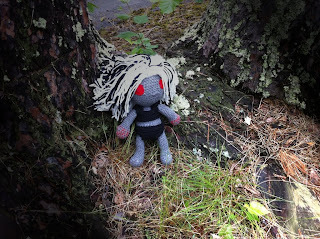 The reason I mention the vacation is because it was on vacation that I created this amigurumi Zombie Witch. We had a house/pet sitter while we were away and we wanted to give him a little something for his troubles. His Father has this company and they were putting on a play at the Fringe, called Brain Cravers Curse of Extollo. It was a fantastic comedy with zombies. Who knew a zombie play could be so entertaining. They won best comedy of the festival. Now take that information, swirl it around and what do you get? The perfect opportunity to make a Zombie Witch! I used a free doll pattern to make her. It was a pretty straight forward pattern. 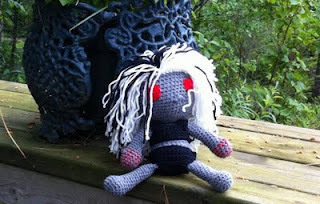 I liked how you crocheted the arms and legs right into the body instead of sewing them on after the body was complete. I worked on her for 3-4 nights while I was on vacation, most of it was after the kiddies were asleep. Some when they were awake. My littlest girl almost really liked her. She wanted to play with her, but I think the odd colouring and hypnotic eyes threw her off! 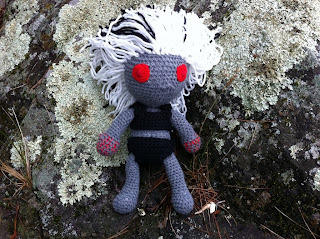 I may have to make her a cute doll. Before we left the island the kids, Zombie Witch and I took a tour around and I snapped some photos. I find her very entertaining. I love the hair. She has a perfect balance of cute and creepy. Happy Birthday to my niece! Today is her birthday; she is the same age as my oldest daughter (10 days apart). Unfortunately, I was stumped when it came to getting her a birthday gift. My kids had no ideas either; in fact my daughter does not know what she wants for her own birthday. I went shopping a couple times, once on my own and once with the kids, nothing jumped out at us. 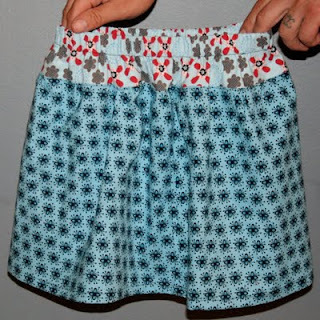 My girl's love their Lucy skirts I made them: here and here (well, my youngest loves to look at it, and wear it for a minute or two) and my niece wears a lot of pretty clothes, so I decided to make one for her. It is a simple skirt, but very professional looking in my opinion. That is where things started to go wrong. Yesterday evening I measured my daughter for reference. After cutting the fabric I realized it was way too short. To compensate I made the bottom hem 1/4". 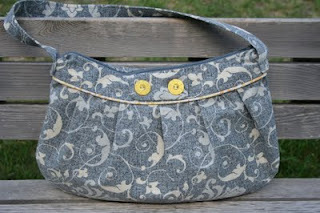 I did not like this, sloppy and I did not catch the fabric all the way around. I was not happy with myself. I could not gift out something that looked so horrible, my mind was still racing with options since her party was a mere 12 hours away. It was bedtime for my kids and I was quickly trying to finish enough of the skirt to have my daughter try it on before bed. Well, here came the second problem...no elastic. I know it is in the house, but where? I did not find it. I will probably find it as soon as I walk in my house after work today. Change of plans, the skirt was not working, no elastic, what to do. 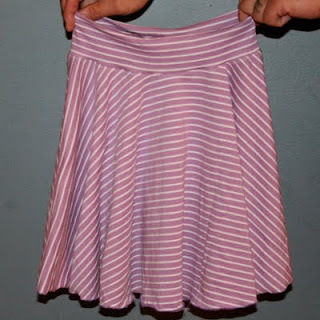 Circle jersey skirt. 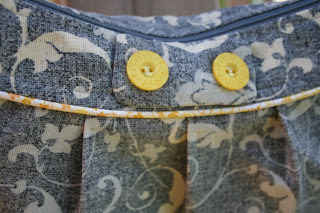 Yesterday I came across this blog entry on iCandy AND I had the perfect fabric at home. It went together beautifully. I put purple thread in my serger and did a rolled hem on the bottom of the skirt. It worked perfectly. I had a renewed sense of accomplishment. Only drawback, I still did not make the skirt I wanted to make, so with my renewed energy I went back to my Lucy skirt and used my seam ripper (a very important sewing tool) and ripped out the hem and redid it with a nice 1/2" hem. I then found different elastic and a coordinating material and changed things up a bit. It turned out cute. 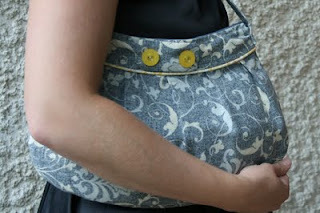 I did up a shirred bracelet to match her skirt too. My husband was nice enough to keep me company while I was sewing. You can see his hands holding up the skirts for your viewing pleasure. I love him. I did not realize until this morning that the Lucy-esque skirt was wrinkly, I should have pressed it before sending it on. Ah well, the kids are almost on their way to the party now with their Grandma while I work. Hopefully she likes her new skirts. Niece, if you are reading this and something does not fit, let me know! Last night my boys went to a sleep over at my Mom's house. So, with just me and my girl's at home I wasn't sure what to do. My older daughter had gotten a friendship bracelet kit for her birthday and had not shown much interest in it. I decided to open it up and see what it was all about. Lots of thread, beads, and instruction in another language, so basically just supplies, no problem. 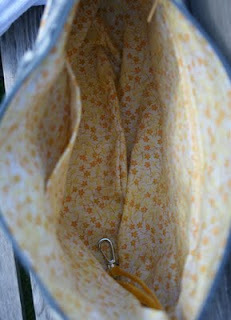 Now, I am sure you are wondering what this has to do with a shirred bracelet! Not much, but because she was busy and my youngest daughter was happy I thought I would do something too. I have many projects on the go, but wanted to stick with something simple. The other day I saw a shirred bracelet somewhere, if I could remember where I would tell you. It looked simple enough so I decided to give it a go. I just so happened to have elastic thread in my supplies that has never been used. This was my chance to use it! First I cut a strip of fabric twice as wide as I wanted the bracelet to be, plus a seam allowance (I eye balled this). Sewed the fabric right side together in a tube. Turned and pressed flat. Second, time to shir. I took my elastic thread and hand wound it around my bobbin. I was trying to do this quickly, so I didn't look up any instructions. 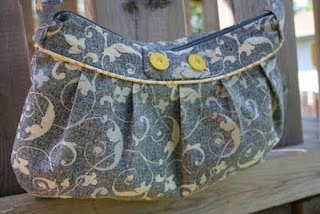 I put the bobbin in my machine, changed the top﻿ thread to match and sewed four parellell lines on the strip of fabric. I was pleased with how it looked, but it was a little weird and twisty, that is until I put my iron to it. Then it did just what elastic thread is supposed to do. Fun Fun. 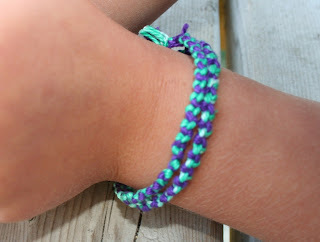 I made a long strip so I could make more then one bracelet. To join them I made another strip of the same fabric 1" wide, overlapped the ends of the bracelet about 1/2" and hid the joint under the matching strip of fabric. 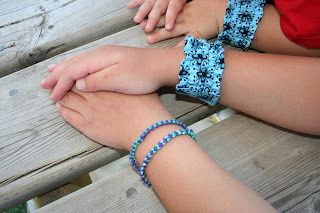 Here are my two girls modelling their new bracelets. I am not sure if they love them, but they will look cute as pie when they wear them with their Lucy Skirts. And just for fun, my girls! 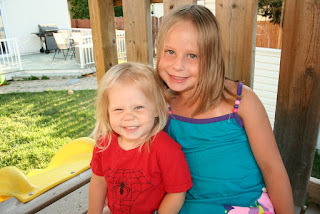 I am linking up to a Friday linky party! 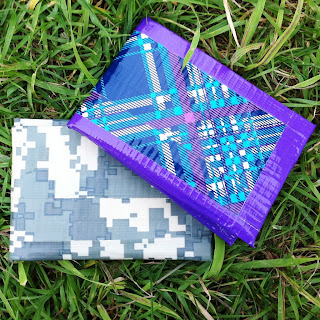 On Father's Day me and the kids sat down to make duct tape wallets while we let my husband sleep in. It turned out the kids had no patience for it. I completed mine, but assured my husband he did not have to use it. It actually came out quite nice, but he has a real wallet. Do you think this would stop me from making more? Apparently not. When I was shopping on my vacation I found patterned/coloured duct tape. I bought it. Tonight I used it. 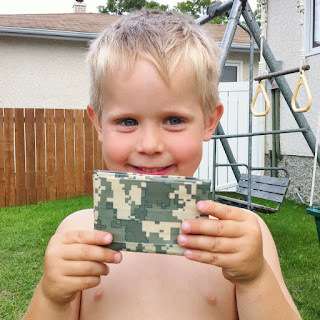 I used this tutorial from Crafty Nest. My 4 year old was very happy to have one made for him. He loves the idea of wallets. I am not sure if it is because his brother has a few or if it is because he wants to see them full of money. 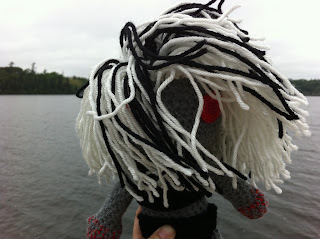 During our vacation last week he caught a large fish. As we were eating the fish for night snacks he asked his Dad how much he would get for the fish he caught! Had he gotten paid for the fish, he would have been proud to put his money in his new wallet. My little girl loved the other one, at least for tonight.